First game of the league was against one of the beforehand favorite teams, it was the team who played last season in division 3 and wanted to advance right away. It was only two minutes in the game and they scored against us and we were forced to work the rest of the game for an equalizer that unfortunately didn't come. Second game was against a team that we completely surprised with the way we played and crushed them with 4 goals. In the third game we had two americans starting, goalkeeper Ian and midfielder Diego. We were playing against one of the top teams and just like the first game we received an early goal after only two minutes. But this time we recovered and managed to equalize to 1-1. In the fourth game, two more American players started the game, forward Nico and defender Oki. This time we won again with a convincing 4-0 against a team in the bottom of the table. 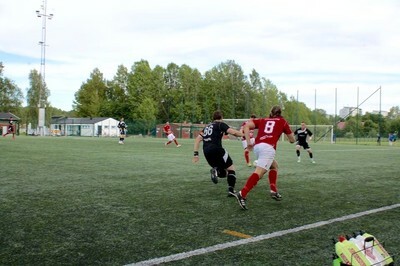 Then it was time for our fith game and a game that would be very special for our team since we played against our previous captain and also another of our previous players. It was a closed game with few chances that both team split the points as it ended 0-0. In the sixth game we played against the top ranked and on beforehand favorites’ for the title. Until now they had won all their games and were of course expected to win against us. However, we did our best game of the season so far and maybe one of the best performances in this league this year. 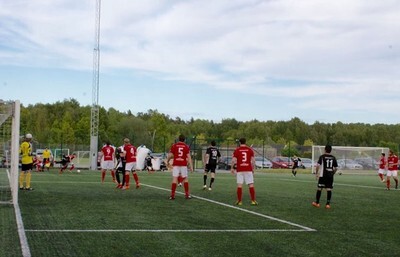 The game ended 1-1 but everyone, even the opponents coaches agreed that we should have won. After this great performance we should have been kept on going but instead our performance got worse. After such a good performance we played two horrible games, first one with a lot of individual mistakes in the defense and a second game with a disoriented and sloppy performance. It was just like everybody had forgotten our game plan and strategies. At this point I was facing some hard decisions, should we keep to the plan and continue play risky with the chance to great performance or to take a few steps back and play with lower risks but think more about the result? I was forced to make the decision for what I thought would be best for the team right now. I have to admit that playing a low risk football is not my cup of tea but that was what needed to be done at the moment. We changed strategy in the last four games. First up was the team we lost against in the first game, a game that was rescheduled to be played in the spring instead of the summer. This time we made the opponents look bad, we controlled most of the game and made them frustrated. We got revenge and won 2-0. Second up was one of the bottom table teams, we showed great patience and could win the game with 3-0. Next up was a team with good form and three consecutive wins. Once again we showed great patience, great defending and creative attacks which resulted 3-0 to us. The last game of the first half of the league was against the team in the relegation zone. They played well in first half and were one of the few teams that could create opportunities to score against us, but we managed to keep a clean sheet and score once in the first half. Second half was a one way street for us and we were attacking all the time. We kept our focus and the whole team played according to the game plan and the final score was a convincing 6-0 victory. It's still a long way till we get to shore and this ship needs to be stronger. We will have time during the summer for maintenance to repair and strengthen the ship so we are ready for new challenges when the autumn comes.